After WOW inaugurated its service from Baltimore-Washington, my wife Fern and I quickly booked our flights at great rates. After staying five nights in Brussels and two nights in Bruges, we had experienced great activities and viewed the top sights. Brussels is the undisputed crossroads of Belgium, if not all of Europe. 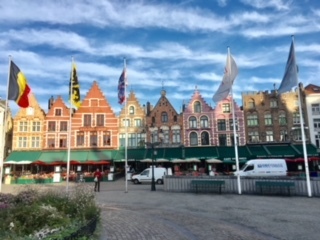 Our side trip to Bruges, in northwest Belgium, allowed us time to fully explore the medieval center, now a UNESCO world heritage site. The canals surround the protected historic city in the shape of an egg. The landmark Atomium (www.atomium.be): This unmistakable symbol of Brussels, an enlarged model of an iron molecule 102 meters high, can be seen all over the city. A thirty minute metro ride from central Brussels to Heysel took us to this shining silver reminder from the 1958 World’s Fair Expo. Walking through tubes and spheres, we saw the permanent exhibition about the building of the Atomium and the history of the expo, a temporary art exhibit on surrealism and spectacular panoramic views of the city skyline from the top level. Ironically this structure was not intended to survive beyond the Expo, but did due to its popularity and success. The European Parliament: We spent most of one day touring the three buildings open to the public without charge. At the Parlimentarium (www.europarl.europa.eu/parlimentarium), we learned a wealth of information about the formation of the European Union from World War 2 to date, as well as its governmental structures. We sat in the Hemicycle where the EU parliament meets and listed to a short audio guide which explained how sessions are translated into 24 languages for the representatives. We also enjoyed the newly opened House of Europe, essentially a historical museum of the European continent. A trip to the world of Chocolate: We indulged in a little self-education at some of the many local chocolate shops. Near the Grand Place, the outstanding chocolate shop Planete Chocolat (www.planetechocolat.com) provides an exceptional one hour demonstration which included samples of hot chocolate and tastings of different Belgian chocolates. Inside the workshop, the chocolate master told us the detailed history behind chocolate in Belgium. He showed us the various stages in making pralines and other tasty delicacies. The Royal Museums of Fine Arts of Belgium: Three separate art museums are interconnected by an impressive inner courtyard. The old masters museum narrates art history from the 15th to the 18th century, featuring its Pieter Bruegel collection. The modern art museum burrows underground for eight floors, displaying a strong collection of Belgian art of the past 100 years. Our favorite was the Magritte museum which presents the largest collection of works by the renowned Belgian surrealist along with quirky works of other surrealists, including paintings, sculptures, posters, photographs and films. Comic culture: Brussels, the home of the comic strip, contains more than twenty wall murals featuring well-known comic characters. At the Belgian Comic Strip Center, we particularly enjoyed learning about comics that were birthed in Belgium, such as the Smurfs. The Center is contained within a beautiful building preserving Victor Horta’s art nouveau architecture. The Museum of Musical Instruments: Contained within three adjacent buildings, this museum hosts a rich and diverse collection of over 1500 instruments, such as giraffe pianos. On the top level, the café presents one of the most breathtaking panoramic views over central Brussels. The Cathedral St. Michel et St. Gudule: The church’s twin gothic towers look down over central Brussels. Inside we viewed outstanding stained glass windows. This large church is the site of royal weddings and christenings. St. Michel is the patron saint of Brussels. The BELvue Museum: Housed in an historic hotel built in 1776, this museum provides a thematic approach to discover Belgium, as its salons feature themes – democracy, prosperity, solidarity, pluralism, migration, language and Europe. Containing over 200 objects, photos, documents and short films, BELvue charts Belgian history from its independence in 1831 to modern day. Coundenberg Palace: Walking beneath the paving stones of the Royal Palace, we went underground through the remains of what was one of the main residences of Charles V. This massive palace was first constructed in the 11th century, then destroyed by a great fire in 1731 and never reconstructed. The site shows archaeological discoveries made during excavations of the past 25 years and allows visitors to view the ruins of former palace rooms. The free harp concert: The daily concerts by Luc Vanlaerne (www.harpmuziek.be) have become a top cultural attraction. In the performance, he features instruments of the harp family and plays his own compositions. The forty minute sessions (pay by donation) take place in his studio close to Holy Mary Church. The Legends of Bruges free (pay by tips) walking tour: For almost three hours, we were thoroughly entertained by a local guide, starting out in Market (Markt) Square and ending in Burg Square. As we walked by the romantic Minnewater (the picturesque lake of love which was created as a reservoir in the 13th century), our guide told us the legend of why swans must be kept in Bruges’ canals forever. As he led us through the 13th century Beguinage, a pretty and serene cluster of small white washed houses, he revealed how these nuns had devoted themselves to charitable work and health care. Our guide even pointed out the house where Jewish orphans were hidden during World War 2. The Lace Center (Kantcentrum): A short walk from the city’s two main squares, down winding cobbled winding streets, we made our way to this working museum. On the first floor, the exhibits explain the intricate art of this ancient Belgian craft through a series of displays and short films. On the second level, local women demonstrate lace making and interact with visitors, discussing their creations. The Basilica of the Holy Blood: In Burg Square, the 12th century basilica is flanked by striking historic civil buildings. The basilica contains one of Europe’s most precious relics, a vial though to contain a few drops of the blood of Jesus Christ. The vial was brought to Bruges in 1149 when Derick of Alscae returned from Jerusalem. The Church of Our Lady (Onze-Lieve-Vrouwekerk): This church contains one of the few Michelangelo sculptures outside of Italy, the world famous Madonna and Child. This small sculpture ended up in Belgium when the original client refused to pay and a merchant from Bruges bought it instead. Later stolen by Napoleon and Nazi leaders, the sculpture was recovered and returned to Belgium by American GIs after World War 2. Frequent inexpensively priced trains: Belgian trains are prompt and clean. They make for easy travel within Belgium. From Brussels airport to Brussels central station, trains run three times per hour and take less than ½ hour. From Brussels central station to Bruges, trains run three times per hour and the trip takes one hour. Best guide books: Foder’s Belgium and Lonely Planet’s Belgium/Luxembourg. The Brussels card: This pass includes free access to 39 museums and discounts to many tourist attractions. We purchased the three day version, but one and two day cards are available. By upgrading to the pass with unlimited public transportation, we easily mastered the seven line metro subway system. The card with transit includes buses, trams and the metro. The Bruges museum pass: This card (www.museabrugge.be) includes admission to 14 museums and attractions over a three day period. We toured six. 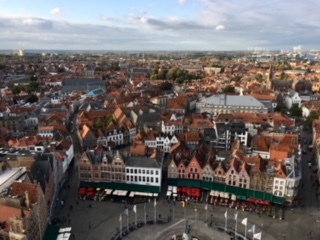 We climbed 366 winding steps to the top of the 13th century Belfry (Belfort) Tower where we were rewarded with a breathtaking view of Bruges, the gorgeous surrounding countryside and the North Sea. We also toured Sint Janshospital, one of the oldest preserved hospital buildings in Europe, which contains the masterpieces of the most famous Flemish primitive artist, Bruges native Hans Memling; the still active 14th century city hall (Stadhuis) a jewel of gothic architecture that features murals presenting a romantic history of Bruges; the Groeninge museum which contains a world famous collection of Flemish primitive paintings and the former law courts (Brugse Vrije) which feature a monumental wood, marble and alabaster fireplace within a court room. Sandeman’s Free Walking Tour: Starting our trip with this “free” (pay by tips) three hour tour was a great orientation to Belgium. Starting in the ornate Grand Place, one of Europe’s most strikingly beautiful squares, we walked through the Park de Brussels, by the former stock exchange and ended at the Royal Palace and Gardens. The tour was very informative. Hilton Grand Place: In Brussels, this hotel is superbly located directly across from Central Station and is walkable from most attractions. Additionally, we really enjoyed the lavish breakfast buffet, the gracious service and helpful directions for walking or taking the metro. By European standards, the rooms were quite large and comfortable. The fitness center was more than expected. The Jewish Museum of Belgium: Recently reopened, this Brussels museum features an exhibition with little link to Jewish history. Indeed the museum no longer contains its collection of Jewish life in Belgium. Similarly, the Grand Synagogue of Europe nearby is no longer open to the public, although we did walk by the massive Romanesque building which features a Jewish star and the Ten Commandments on its front side. The Palace de Justice in Brussels: One of the world’s largest legal buildings, the law courts are under reconstruction and only several floors can be visited. We did get a peek at a trail in session, the old fashioned black robes worn by the judge’s assistants, the enormous entry hall and a gallery of the heads of famous Belgian lawyers – all men. Green spaces: In central Brussels, directly across from the Royal Palace, the Park de Brussels provides a small bit of park land. We walked by the Botanic Gardens in Brussels which showcased carefully manicured plants, trees and symmetrical gardens. Way out by the Atomium, the Park de Laeken provided enough park land for Brussels joggers, walkers and bicyclists to get in their workouts. In central Bruges, Minnewater is the most scenic green space. Tourists everywhere: Both in Brussels and Bruges, we were surprised by the vast number of tourists walking by. Although this did not diminish our enjoyment of Belgium, we did keep a close eye on the crowds and our belongings. For Fern and I, our WOW trip to Belgium was one of our most informative, diverse and enjoyable trips abroad. The local residents were friendly. We ran out of time before we ran out of activities to do in Brussels and in Bruges.